Lindsay was an artist, poet, activist, campaigner and more. She’d worked for 38 Degrees, Rethink Mental Illness, Camden and Islington NHS Trust and studied at the School of Oriental and African Studies (SOAS), University of London. Those near and dear to Lindsay are setting up a fund dedicated to the things she championed – getting better support and treatment for those in need – using research as a focus. 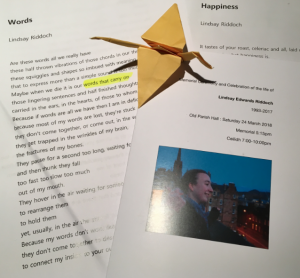 The fund is called Words That Carry On: Lindsays Fund from a line in one of her poems and we hope they will with our help at the McPin Foundation. Lindsays’ father, Rob, gave a fabulous tribute to Lindsay, emphasising how much he missed the jokes and laughs they shared. Her friend emphasised her directness, straight talking, fierce intellect, charm, loyalty and humour. Lindsay’s mother – Fiona – guided us through the celebration including introducing a picture montage covering Lindsay’s 24 years. A photo of Fiona’s arms wrapped around her daughter up a mountain, only taken a few years ago, brought my tears flowing. Probably because I am a mum too – recognising how hard it must be coping with child bereavement of any kind, including after suicide. I was sitting next to staff who had looked after Lindsay during stays in hospital and friends from university. We heard Lindsay’s voice as she read her own poem ‘Words’. We listened to a song adapted and performed by two of her friends: a unique and brilliant version of Frank Turner’s ‘Long Live the Queen’. This was a really difficult hour for so many people. Everyone was moved and thoughtful, remembering Lindsay. As an outsider, I thought it was beautiful. A mix of calm and emotion. Recognition of this brilliant person – challenging others, academically gifted, caring about her friendships, and always valuing others. I left with people signing up to support Words That Carry On – our hope is that we can collectively achieve something for Lindsay, something she would be proud of putting her name to. Please visit the new website – Words That Carry On: Lindsay’s Fund and sign up as a supporter. Lindsay’s fund has been set up to invest in more and higher quality research for people with personality disorders and autism, keeping their lived experience at the heart of the research.